Israeli Maj Gen Kamil Abu Rukun warned that Hamas “has crossed a red line” and Israel would “continue to respond with an iron fist against all terrorist activity or rocket fire””. The group’s military wing, the Izzedine al-Qassam Brigades, said the Israelis opened fire, killing a local commander, Nur Barakeh. What has happened since Sunday’s operation? 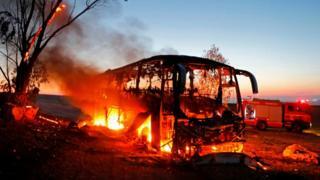 Fawzi Barhoum, a spokesman for Hamas, denounced the incident as a “cowardly Israeli attack”. IDF chief Lt Gen Gadi Eisenkot said the Israeli unit had carried out “a very meaningful operation to Israel’s security”, without giving further details. The Israeli military had warned that the property would be targeted, accusing the channel of broadcasting “propaganda”, and staff had evacuated. Broadcasting reportedly resumed after a brief outage. The IDF later said the military also hit Hamas’s military intelligence headquarters. Hamas won Palestinian elections in 2006 and reinforced its power in the Gaza Strip after ousting West Bank-based Palestinian President Mahmoud Abbas’ rival Fatah faction in clashes the following year. While Mr Abbas’ umbrella Palestine Liberation Organisation (PLO) has signed peace accords with Israel, Hamas does not recognise Israel’s right to exist and advocates the use of violence against it. Sunday night’s incident comes after apparent progress in an Egyptian- and UN-brokered process to mediate after a series of escalations between the two sides in recent months.